25 January 2018: The Bajaj Pulsar RS400 is a fully faired motorcycle which is likely to grace the Indian shores in this year. It will be the flagship model of Bajaj once it is up and ready and design-wise, it looks quite aggressive. The cuts, fits and panels depict its busy style, which is also its USP. The fairing it sports is huge and the fuel tank also seems to be big, at least 15-litres of capacity. Up front, there is a twin-projector headlamp with LED DRLs, the side is packed with fairing and features a race exhaust. At the rear, it gets unique tail end design with LED tail light. You’d find it difficult to get your eyes off its muscular stance. Further, it sits on the perimeter frame, boasts ABS as standard and Nitrox mono-shock suspension at the rear. Mechanically, the new Pulsar RS400 will feature a liquid cooled, triple spark 373.2cc engine with fuel injection system capable of producing 42PS power at 9,000rpm and 34.5Nm torque at 7,000rpm. The engine is mated to a six-speed gearbox and it is expected to hit the top speed of approximately 165Kmph. The mileage of the bike would fall in the range of 22-25kmpl. There is a high possibility of Bajaj going vibrant with the RS400’s colour choices. So, you can expect the bike to be painted in yellow, blue and red which will add to its bold avatar. 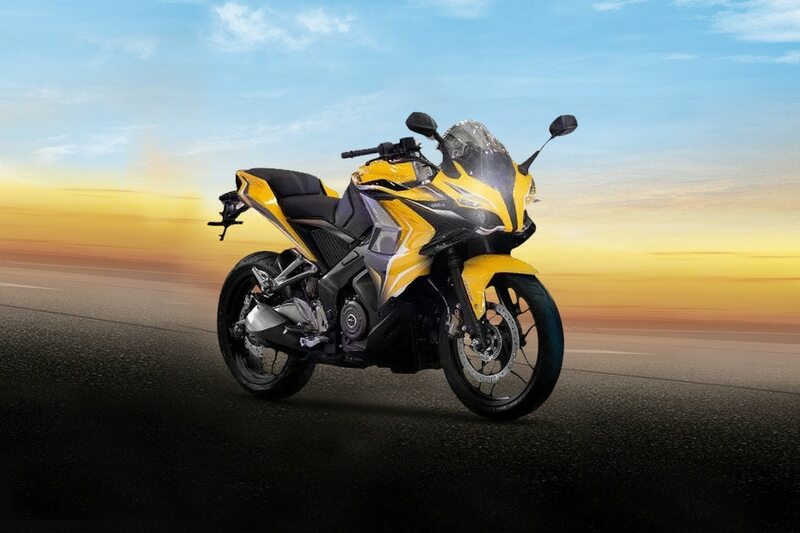 There will be two variants on offer: the Pulsar RS400 and the Pulsar RS400 with ABS. The likely price tag it would carry will fall in the range of Rs 1.6 Lakh to Rs 1.8 Lakh (Ex-showroom, Delhi). In the Indian market, Bajaj Pulsar RS400 would be up against the likes of KTM RC 390, Ninja 300, Benelli TNT300, Yamaha R3 and the TVS Apache RR 310. The side view and front view are good. A nice sporty look. Comfortable for long ride also, great performance and stylish. Q. What is the mileage of this bike? A. The mileage of is Bajaj racing machine is approximately 26kmpl. But mileage of any vehicle always depends on certain factors like riding condition, time to time service management, tire pressure maintenance etc. Bajaj is preparing to level up the competition in the performance-oriented segment with its upcoming powerhouse Bajaj Pulsar RS400. Recently, a few spy shots of the bike have circulated over the Internet and it has also been caught testing on the road a couple of times- hinting that it will be launched soon. Sharing the design cues with its younger sibling, RS200, the new Pulsar RS400 gets a full-faired look with fine cuts and edges. The design language embedded in the making of RS400 is absolute bliss to encounter. The twin projector headlamp set up upfront and a unique tail lamp alignment make it for an enticing posture. Pulsars in the past have been known for their raw performance and RS400 won’t disappoint you either. It will feature a liquid cooled, triple spark 373.2cc engine with fuel injection system with a max power of 42PS and 34.5Nm of peak torque. The ride quality on offer would be terrific- thanks to its suspension assembly that has telescopic forks at the front and Nitrox mono-shock absorbers at the rear. Like its sibling, the Pulsar RS400 gets aggressive styling. The design looks quite busy. There is an array of cuts and edgy lines that can be spotted from the naked eye. The bike sports a huge fairing that envelopes the large fuel tank (expected to be of 15-litre capacity). The front is bold featuring a sharp headlamp cluster with integrated small windshield, twin-projector headlamps with LED DRLs. The new Pulsar RS400 is likely to get the same instrument cluster as the RS200, which is semi-digital- analogue tachometer and digital speedometer. Adding to its striking appeal are elements like spilt seats, race exhaust, chiselled fuel tank, clip-on handlebars, LED tail lamp, modern alloy wheels and the all-important perimeter frame. Talking about the paint schemes, expect it to come with vibrant colours- yellow, red, blue and black. Nothing is official in this regard at the moment though. Having said that the bike comes with a lot of cuts, lines and edges, Pulsar RS400 is not for everyone as some would regard it as the overdone version of the RS200 especially in terms of design. Built on the perimeter frame, RS400 rides on the conventional telescopic front forks with anti-friction bush and Nitrox mono-shock absorbers at the rear. On the braking front, there is 300mm disc at the front and 230mm disc at the rear which in combination with MRF rubber lends supreme braking force to the Pulsar RS400. The much-needed ABS (Anti-lock Braking System) is standard on this upcoming Bajaj bike. It sports 17-inch alloy wheels with tubeless tyres. The combination of chassis, suspension assembly and brakes is worth admiring as it arms the rider with great confidence when getting around the corners at high speeds. The bumps can be easily bypassed and brakes can be applied instantly without stressing the wheels and locking them. Bajaj Pulsar RS400 is equipped with ABS that not only adds to the safety front but gives the rider the confidence to push the bike to corners and on the straight line and at the same time feel the punchy engine. Plus, there are discs to provide optimum braking force and tubeless tyres for enhanced longevity.